Import parity is the price point where a product's price matches the value of the same product produced overseas plus all costs related to importing it into the country. This price is particularly important in industries where imports are a serious substitute threat to locally manufactured products as they may limit the price a company can charge for their manufactured products. The import parity price usually has several components which include the total all in manufacturing or purchasing cost of the product, transport to port and packaging, shipping cost including fees, import tariffs, local transport to warehouse or distribution centre. When looking at import parity prices for products the analysis is usually done by comparing several countries as import sources for the product.Import parity analysis is usually part of corporate and business strategy in a company. 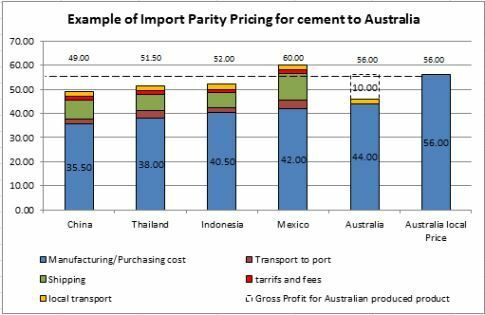 The following example analyses the import parity price for cement into Australia. Please note the figures used are for illustration purposes only. In the analysis shown above we can see that the Australian manufacturing cost is just below the cheapest import parity price , meaning that the local industry is still competitive but three countries: China, Thailand and Indonesia could still be profitable if cement was imported from these locations. The analysis above doesn't include other unforseen costs such as the cost of quality issues, problems in the importation process and other supply chain issues . Given the slim margins obtained from importing the product a company may actually suffer losses, but a business with a reliable supply chain overseas and locally could still import economically.